Cut the broccoli into florets, blanch in boiling salted water for approx. 1 min., dip briefly in ice-cold water, drain well. Peel the potatoes and cut into slices approx. 5 mm thick. Cut the spring onions into thin rings. Arrange the potatoes, spring onions and broccoli in the prepared dish, season. Heat the butter in a pan. Add the flour and cook, stirring with a whisk; the flour must not take on any colour. Remove the pan from the heat. Pour in the milk, bring to the boil while stirring. Reduce the heat and simmer for approx. 10 mins., stirring occasionally until the sauce is thick and creamy. Stir in the crème fraîche, season. Finely chop the dill and chervil, stirring half into the sauce. Pour the sauce over the vegetables. Bake for approx. 35 mins. in the centre of an oven preheated to 200°C. Cut the salmon into approx. 2 cm cubes. Grate the zest from the lemon and squeeze out 1 tbsp of juice. Mix the salmon, lemon zest, lemon juice and oil with the rest of the herbs, season with salt. 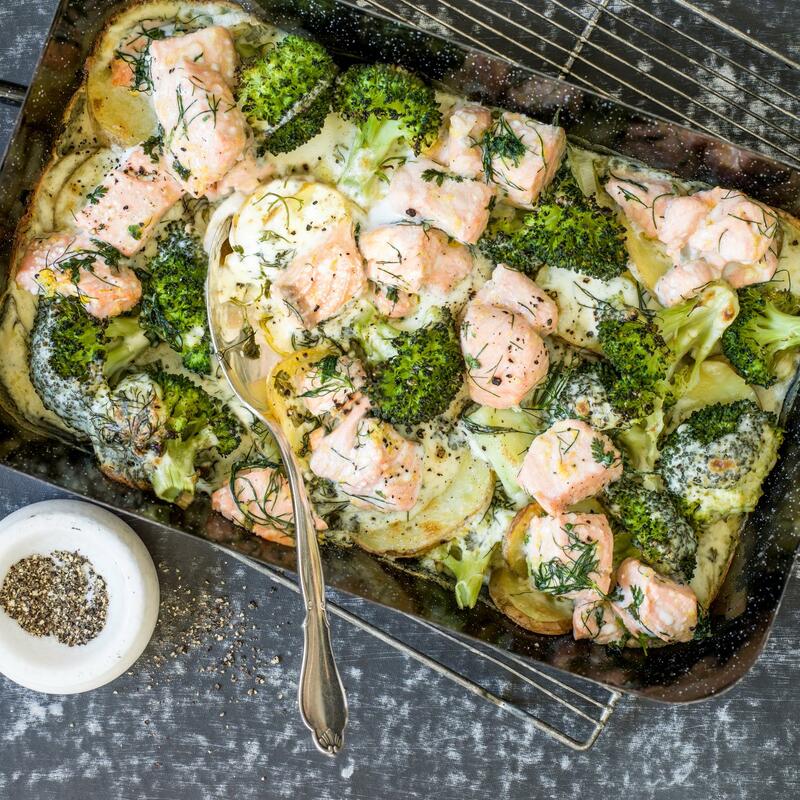 Arrange the salmon on top of the vegetables, return to the oven for approx. 10 mins. until cooked.